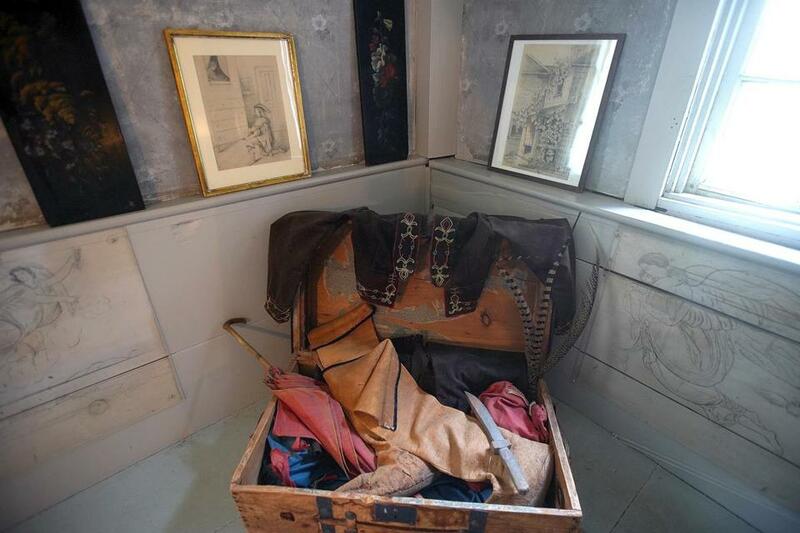 A trunk at Orchard House in Concord contains costumes made by the Alcott sisters which they wore performing plays at home — a pastime also featured in “Little Women.” The youngest sister, May, drew mythological and biblical figures on the woodwork and walls of her bedroom. With their father away on a long-term professional gig, four teenage sisters who dream of changing the world as artists, writers, and thinkers turn to their mother for counsel and comfort. It may sound like the perfect story for today, emphasizing the potential of incipient feminists who are more consumed with matters of creativity and political activism than fashion or domesticity. As well-received as the book was upon publication, it feels barely less timely now — which may be why two new screen adaptations of the story have been made over the past year and a third — the most high-profile — is in the works: a feature film directed by Greta Gerwig set to open in December 2019 starring Meryl Streep, Saoirse Ronan, Emma Watson, and Timothée Chalamet. Other current versions include the three-episode miniseries jointly produced by the BBC and PBS’s “Masterpiece,” which aired in May and starred Maya Hawke, Michael Gambon, Angela Lansbury, and Emily Watson; and a modern retelling directed by Clare Niederpruem and starring Lea Thompson that opens in theaters Sept. 28. Each of these — along with earlier versions including the 1994 feature that starred Winona Ryder, Christian Bale, Susan Sarandon, and Kirsten Dunst; the 1949 film with June Allyson and Elizabeth Taylor; and the 1933 film with Katharine Hepburn — explores the perennially beloved story of the March sisters and their mother, who write, draw, talk, quarrel, and emote in a community evocative of Alcott’s Concord hometown while their father is away ministering to soldiers during the Civil War. 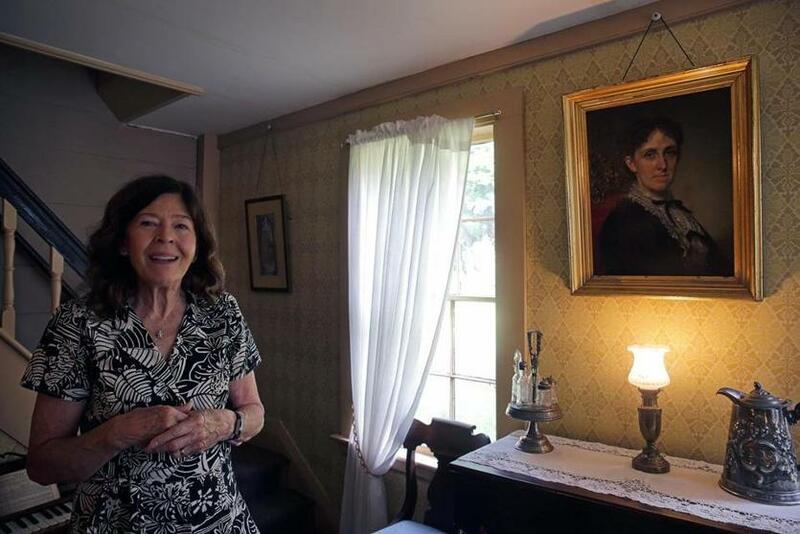 Jan Turnquist, executive director of Orchard House, stands next to a portrait of Louisa May Alcott. 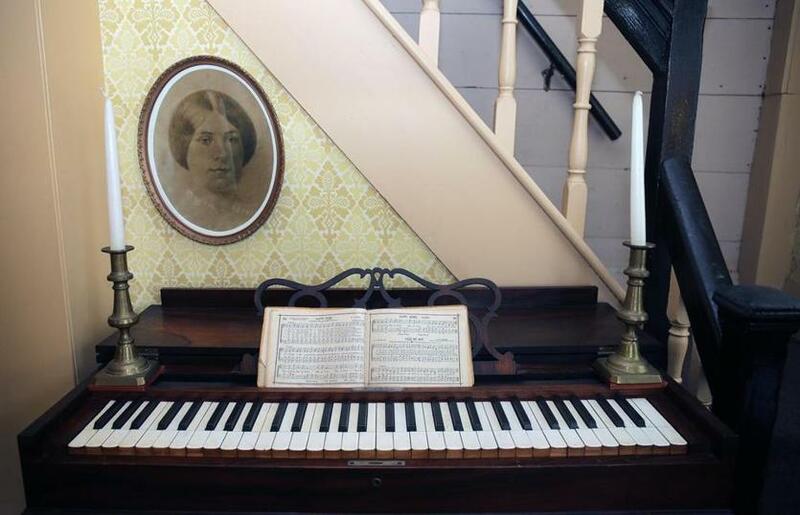 Each of the current versions has something else in common, too: the expert counsel of Jan Turnquist, who has served for nearly 20 years as executive director of the Orchard House in Concord, the museum that was young Louisa May Alcott’s home when she penned that book as well as several others and served as a salon to the Alcott family’s literary circle of friends that included Emerson and Thoreau. Perhaps reflecting Hollywood’s new emphasis on accuracy in historical retellings, the recent adaptations have called upon Turnquist serving as an informal consultant on everything from props to backgrounds — and she couldn’t be more pleased. The PBS Masterpiece version even brought Turnquist to Ireland as a set consultant. The verdant pastures near Dublin may resemble Concord’s 19th-century farmlands, noted Susanne Simpson, deputy executive producer for Masterpiece, but the architecture differs somewhat. It was a learning experience for Turnquist as well. The Masterpiece writers, led by Heidi Thomas of “Call the Midwife,” scripted a scene for “Little Women” in which a character’s grandfather gives him a football for Christmas. Uncertain about the accuracy of that detail, Turnquist did her research and found references to American football dating back to 1862, so the scene was viable. For director Clare Niederpruem, whose contemporary interpretation opens on Friday, Sept. 28, visiting Orchard House for inspiration as she worked on the film was a homecoming of sorts. Although Turnquist has devoted her career to authentic representation of the Alcott family, she greets each new “Little Women” production with an open mind. 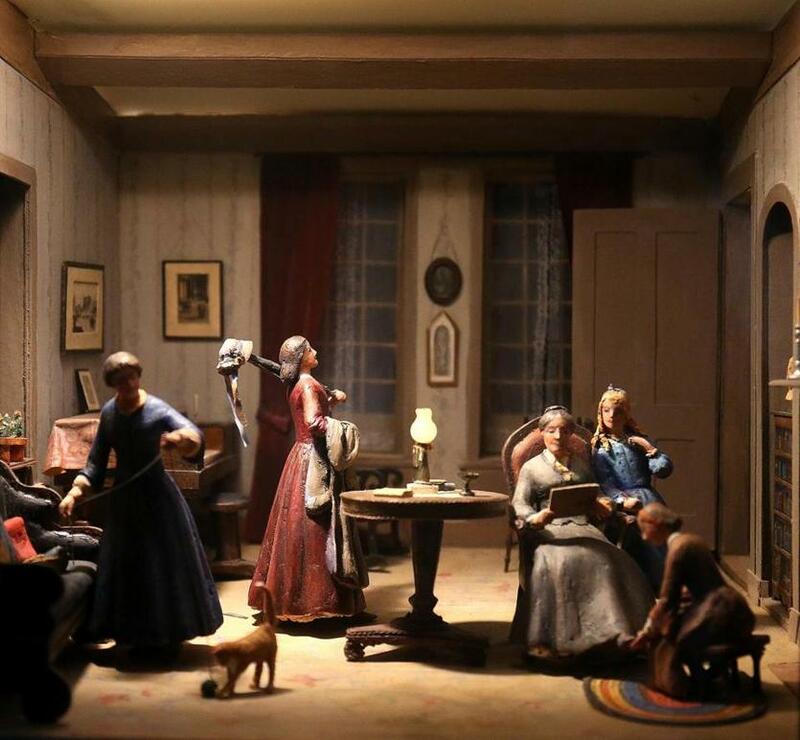 A diorama scene from "Little Women" was hand made by Louise Stimson of Concord and donated to Orchard House in 1968. Besides, it gives her an opportunity to clear up certain misconceptions — such as when she was invited to an early investors’ event for the Broadway production and heard the gentleman seated behind her telling his female companion that it was a travesty to “Americanize” the story of this British family. Turnquist patiently kept silent until she was introduced to the same fellow at a post-meeting reception, when she tactfully set him straight on Alcott’s national origins. “Everyone is homing in on ‘Little Women’ right now because of the 150th anniversary, but the reason it has endured is that the basic story of sisters who love each other through all kinds of ups and downs is meaningful in every interpretation and every culture,” said Turnquist of the book, which has been translated into more than 50 languages. The Orchard House will hold its own 150th birthday party for “Little Women” on Sunday, Sept. 30, from 1 to 4:30 p.m. with 19th-century crafts, cider-making, a string quartet, contemporary ballet and vintage dancers, a progressive “Little Women” read, and refreshments. Admission to the celebration is free. For more information, go to louisamayalcott.org. 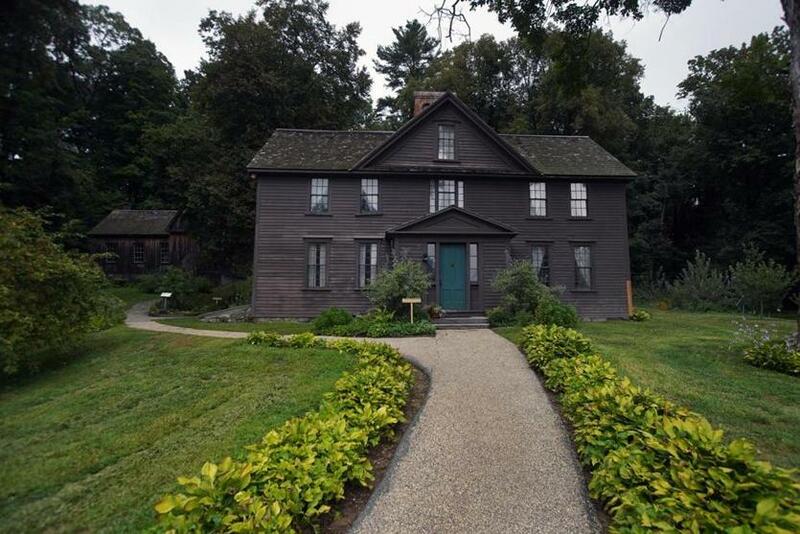 Orchard House will hold a birthday party for “Little Women” on Sunday, Sept. 30. 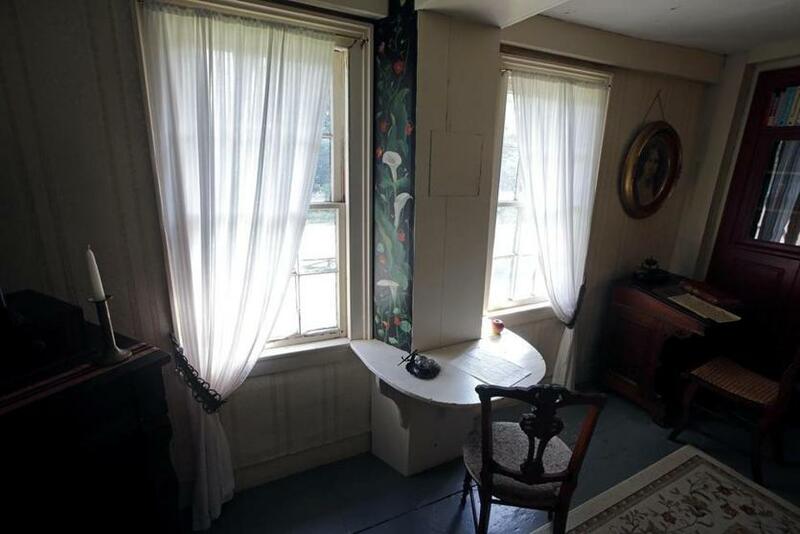 Louisa May Alcott’s father, Bronson, built this desk where she wrote “Little Women.” Her youngest sister, May, painted a panel of calla lilies and nasturtiums beside the desk to cheer Louisa. 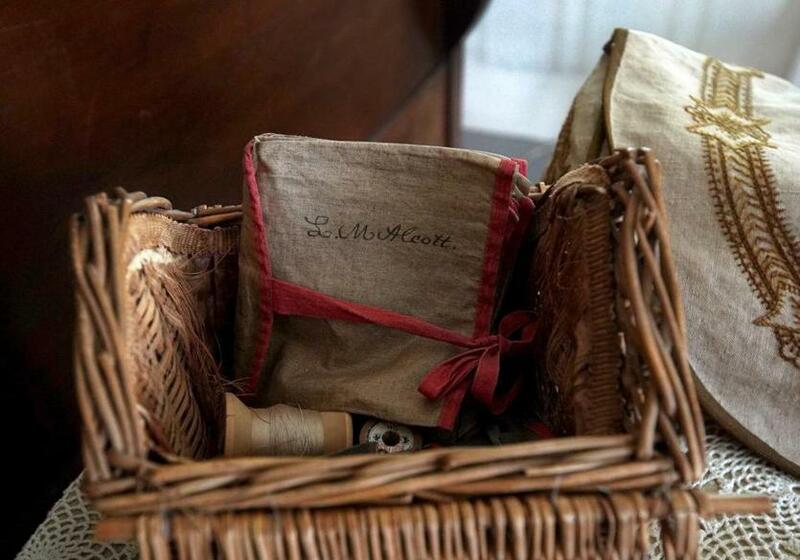 Louisa's handwritten name is on sewing kit materials on display at Orchard House.